My first pontoon boat review was equally comical. I was documenting my musings in a reporter’s notebook, which handily fits in a back pocket, and had my pen jammed into the wire spiral. Only after I had sat in every seat did I realize my ballpoint pen was deployed. I’d left indelible ink squiggles everywhere I sat. That day I learned that no matter how furiously you rub spit with your index finger, the lasting power of the pen is mightier. The contents of the magazine back in ‘96 point out how far the marine industry has progressed. Honda was touting its new 90 hp four-stroke, the largest of its kind at the time. Now, Seven Marine builds a 627 hp four-stroke. Also in that issue were six pontoon boat reviews. 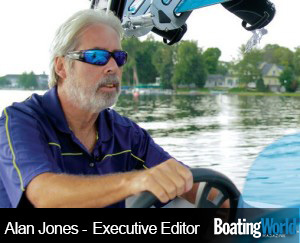 The fastest of the bunch was a JC Pontoon 226, powered by a 250 hp MerCruiser sterndrive. It hit an amazing-at-the-time 40 mph. Last year, Brad Rowland went 117 mph on his South Bay 925. Many of the companies within its pages are no more — e.g., OMC and Riviera Cruiser — and there were several other items that don’t exist anymore, such as Polaris and MasterCraft PWCs. But the years have also exacted a toll as partial payment for the fun I’ve had. I severed my ACL slipping on a salmon dock in Echo Bay, B.C., during a 1,500-mile trip on a 26-foot Glacier Bay from Seattle to Glacier Bay, Alaska. Then I slipped coming off the front deck of a boat at the Miami Boat Show, tearing the MCL in the same knee. In retrospect, I wish I had read the Chicago Tribune’s famous 1997 “Guide To Life for Graduates,” which talked about taking care of your knees and wearing more sunscreen. They weren’t kidding about the sunscreen.